What is the highest available resolution for your laptop? What laptop do you have? Run a dxdiag.exe on your computer so we can make sure there will not be other issues. How to do a dxdiag depends on your operation system. Use the search function on your computer. Check to make a text file of the dxdiag.exe and then attach it to your reply using the full reply (More Reply Options) and not the quick reply. Read this. Did you look at the minimum specs for the program before you bought it? Did you buy it at a big box store, directly from Roxio/Corel, or is it a pirated version? Purchased directly from Roxio's web site and it is an original copy. Not sure as to how to run dxdiag.exe. First, if you want help you must provide the information requested or just tell us to forget the question you asked. What about the dxdiag.exe file? Did you follow the instructions in the link? Do not use a phone to post or reply to this forum. Most manufacturers have several variations on one model number. For instance, they can change the CPU, the amount of memory and the amount of storage. Note that your laptop is not even listed on Toshiba'S web site. We need the dxdiag.exe information (note that the blue text in my first posts are links. If you can't follow those directions, it is doubtful if you can be happy with the program. Why don't you use the highest resolution? What are you afraid of? The text may be small but you can change that - you want 100% (96) dpi. Joe E, can you tell us about 1) How much computer experience do you have and 2) Age group. If we know that, then we can tailor our responses to you. 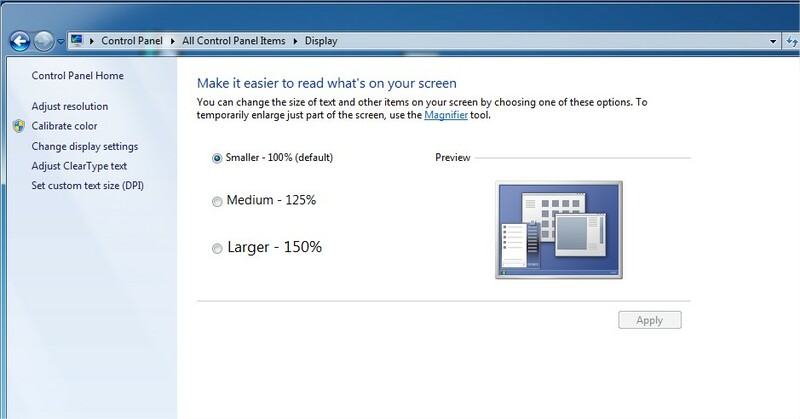 Do you have your system set to "Make it easier to read" what's on your screen? This will upset the Roxio programs in the way you've described, and is worth checking before you get into the complicated stuff. Go to Control Panel > Display and you'll see a panel like this one. Here's the Windows 7 one. If the button on 125% or 150% is clicked, the Roxio program can get upset. Make sure the 100% button is clicked, and then "apply" [bottom right]. If this was your problem, selecting 100% will fix it. .dmsm is a road map of your production, this file is here, this audio is there, no actual video format. You need to click up top in the menu, output, export as then choose a format and create the video file. 4.3 and 16.9 productions offer different formats.